You are at:Home»News»Honor The Hero Veterinarian Or Hero Veterinary Technician in your Animal’s Life! Honor The Hero Veterinarian Or Hero Veterinary Technician in your Animal’s Life! WASHINGTON, D.C., January 28 – For millions of Americans, animals are not just their best friends, but their heroes. Whether they are lending eyes to the unsighted, ears to the deaf, protection to the sleeping family and the soldier, or providing a welcoming kiss at the end of a hard day, animals affect us in so many different ways. And behind almost every hero pet (and millions more animals) is a hero veterinarian or hero veterinary technician. These often little-known benefactors save and improve the lives of our two- and four-legged best friends in many ways, and now it is time to honor their achievements. American Humane Association, the country’s first national humane organization, recognizes the hard work these professionals put in day-in and day-out in the name of helping animals, and is pleased to announce that nominations are now open for the second annual American Humane Association Hero Veterinarian and Hero Veterinary Technician Awards™, presented by Zoetis Inc. Pet owners and animal lovers alike are invited to visit www.herovetawards.orgbetween now and March 13 to nominate their favorite veterinary professionals who are dedicated to the betterment of the health and welfare of animals and the promotion of the human-animal bond. The winning veterinarian and veterinary technician will be flown to Los Angeles to be honored as part of the fifth annual American Humane Association Hero Dog Awards™ on September 19, which will air nationwide as a two-hour special on Hallmark Channel this fall. Last year’s top winners among the nearly 700 nominees were Eva DeCozio, DVM, of the VCA Apache Junction clinic in Higley, Arizona, named 2014’s American Hero Veterinarian, and Signe Corbin of the Westlake Animal Hospital in Austin, Texas, 2014’s American Hero Veterinary Technician. But these awards are not limited to companion animal veterinarians. Professionals from all fields of veterinary medicine are eligible for entry including, but not limited to those who work in: research, emergency services, shelters, and those who work with large and exotic animals. The five finalists in the American Hero Veterinarian and American Hero Veterinary Technician categories will be selected by a special blue-ribbon panel of judges consisting of celebrities, veterinary professionals, and animal care professionals. Beginning April 29, the American public will be invited to vote online for their favorite veterinarian and veterinary technician. 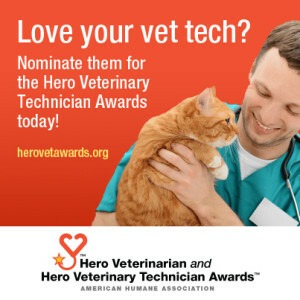 To nominate a veterinarian or veterinary technician between now and March 13, and for complete contest rules, please visit www.herovetawards.org. To nominate a Hero Dog in your life for the 2015 American Humane Association Hero Dog Awards™, please visitwww.herodogawards.org between now and February 25. American Humane Association is the country’s first national humane organization and the only one dedicated to protecting both children and animals. Since 1877, American Humane Association has been at the forefront of virtually every major advance in protecting our most vulnerable from cruelty, abuse and neglect. Today we’re also leading the way in understanding the human-animal bond and its role in therapy, medicine and society. American Humane Association reaches millions of people every day through groundbreaking research, education, training and services that span a wide network of organizations, agencies and businesses. You can help make a difference, too. Visit American Humane Association atwww.americanhumane.org today. Zoetis (zō-EH-tis) is the leading animal health company, dedicated to supporting its customers and their businesses. Building on more than 60 years of experience in animal health, Zoetis discovers, develops, manufactures and markets veterinary vaccines and medicines, complemented by diagnostic products and genetic tests and supported by a range of services. In 2013, the company generated annual revenues of $4.6 billion. With approximately 9,800 employees worldwide at the beginning of 2014, Zoetis has a local presence in approximately 70 countries, including 27 manufacturing facilities in 10 countries. Its products serve veterinarians, livestock producers and people who raise and care for farm and companion animals in 120 countries. For more information, visit www.ZoetisUS.com. Hallmark Channel, owned and operated by Crown Media Holdings, Inc., is a 24-hour basic cable network that provides a diverse slate of high-quality family entertainment available in high definition (HD) and standard definition (SD) to a national audience of 85 million subscribers. Hallmark Channel is the nation’s leading destination for quality family programming featuring an ambitious slate of original content, including movies; scripted series, such as Cedar Cove andWhen Calls the Heart; annual specials like Hero Dog Awards and Kitten Bowl; and a daily 2-hour lifestyle show, Home & Family. Hallmark Channel is also home to annual holiday franchise, Countdown to Christmas, featuring a lineup of 24/7 holiday programming, includingThe 12 New Movies of Christmas. Rounding out the networks’ lineup are television’s most beloved sitcoms and series, including The Golden Girls, The Middle, Little House on the Prairie,and Frasier. Hallmark Channel’s sibling network, Hallmark Movies & Mysteries, available in HD and SD, features a unique mix of content including original movies and acquired series that are dramatic in tone and focus on the lighter side of the mystery genre, as well as classic presentations from the acclaimed Hallmark Hall of Fame library. Goodnewsforpets.com curates news of interest and importance to informed pet parents inclusive of the veterinary profession and pet industry.